A film about the complex relationships between fathers and daughters, and the potential lifelong consequences of those relationships. A Hollywood film director assembles a group of friends and strangers for a social gathering on Valentines Day in a deserted movie theater where he interviews each one on their opinions on love and loneliness. In this follow up to 'Hollywood Dreams' and 'Queen of the Lot', cheerful and neurotic actress Maggie Chase has cut some of her losses and focuses her acting career at local theater in West Hollywood. Still employed by her acting entourage of Gio, Kaz Naiman, Hildi, as well as the Lambert family, Maggie has reduced some of her neurosis and seems to find peace until she has a meeting of minds when she meets Stewart Henry, a slick and hotshot TV star who is seeking his own career choices by making the transition from TV and film to live theater. Written by Larry B. 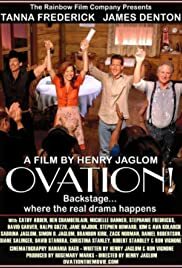 These Henry Jaglom movies are all the same. The ones with real life girlfriend Tanna Frederick. There's always a semi famous actor cast as a guy who instantly falls in love with her character, and she has to fight him off, basically, and this doesn't do justice to the kind of character-actress that Frederick is, and should be portrayed as. She could be a fantastic friend-of-the-leading-lady in a mainstream feature, and steal it, perhaps. The problem is that Henry puts her too much up front, with every character surrounding her constantly propping her up. This movie is better than any of the "Maggie Chase" films also including Queen of the Lot and Hollywood Dreams. Jaglom's daughter, Sabrina Jaglom, is and has always been a gorgeous girl, but even she's not given the push that's needed to use these kind of movies as Actor Reels for bigger and better things.